This is a guest post written by new Saha Board Member, Mark Moeremans! After almost 7 years of successfully working in rural communities of Northern Region Ghana it is safe to say that Saha Global is growing in every sense of the word. 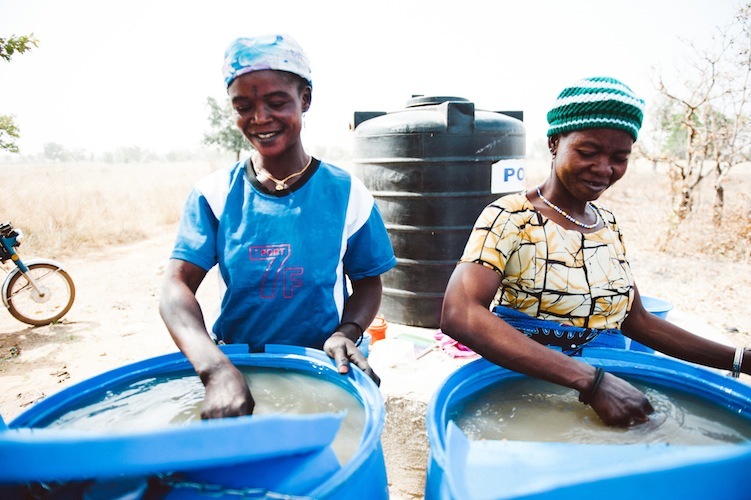 Whether you are counting the number of new businesses opening each year, the number of field reps participating, the number of schools we are partnering with, or the scale of impact that the organization is having in Ghana, Saha is becoming a tour de force in the field of international development. 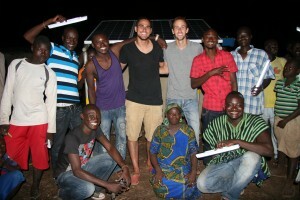 It has been my incredible honor to play a small part in that growth, originally as a water field rep in 2012, and later as I piloted the solar program in the fall of 2013 with my social enterprise teammate Ben Powell. This past fall, I was approached by Executive Director Kate Clopeck with a new opportunity to get involved and continue to support the growth of the organization. Kate recognized the need to make adjustments to the organization in order to avoid hitting a ceiling, and wanted to start putting processes and structures in place that would allow for this growth to continue. With plans to launch business in a new country, Kate wanted to make sure that everything internally was running smoothly so that her team had the capacity and direction to support the expansion. 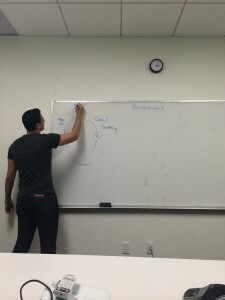 My background as a management consultant combined with my knowledge of Saha Global put me in a unique position to advise the Saha team on how to change, adapt, and grow their own structure, processes, and habits to make sure no one’s time or skills were being wasted. My first step was to get the US Staff on the same page – conducting a one day workshop with the team to better understand roles and responsibilities and expectations about what work needed to get done. This information was used to create role profiles – succinct job descriptions outlining the tasks and responsibilities of each US employee. These profiles are aimed to ensure clarity and transparency regarding what the team was accountable for while eliminating any redundancies. Finally, these were supplemented by a detailed competency model, a talent framework emphasizing the skills and attributes that are needed to be successful in the organization. This will provide the US team with a consistent set of language to talk about professional development and giving the US team the opportunity for the same type of career conversations as their counterparts in for-profit companies. 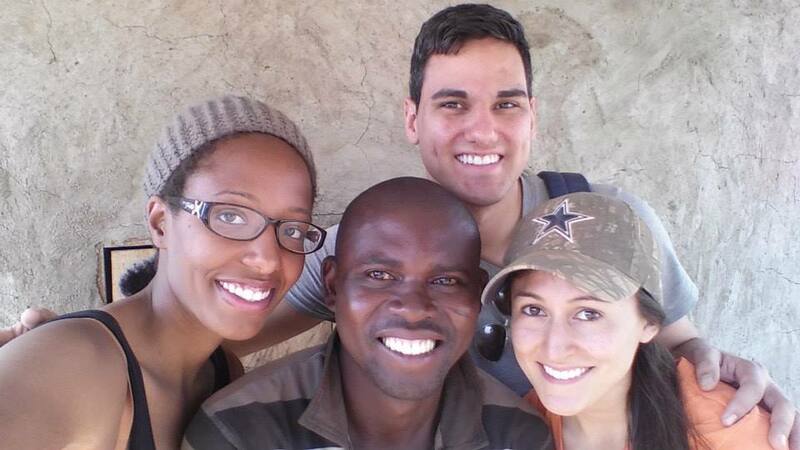 Hanging in Ghana with Saha Senior Manager, Amin, and two of the 2015 Winter Field Reps, Marsha and Sarah. It wasn’t just the US Team that needed to adapt. 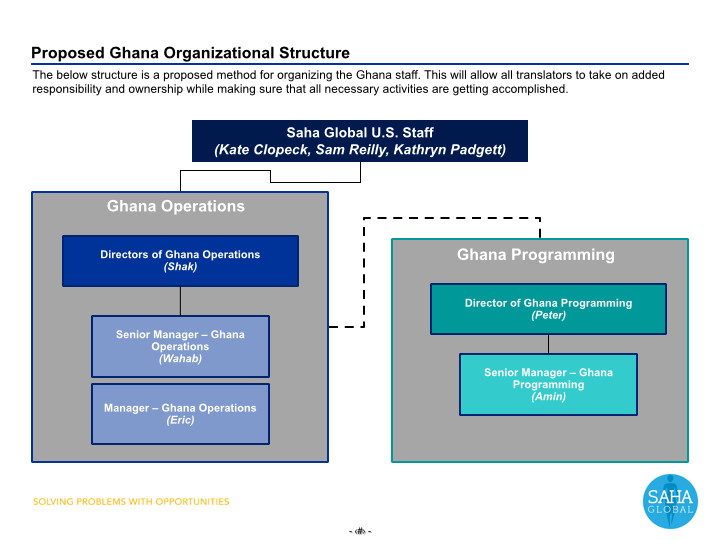 With the promise of a new country on the horizon for Saha Global we needed to be sure that Ghana operations would continue to run smoothly once there was another country to support. For the Ghana staff that meant moving them toward greater self-management, a pipe-dream for most international non-profits. We knew the Ghana staff had the smarts and the gumption to get the job done, they just needed a bit of direction, same as the US team, and that’s where I came in. I recently traveled back to Ghana in early January to assess the situation on the ground and see what I could do to help make them more independent. Every team member was thrilled at the opportunity for more responsibility, they were eager to learn and wanted to make the most of my time. After a brief observation period I set to work, realigning the Ghana team to create a division of labor based on people’s skills and interests. 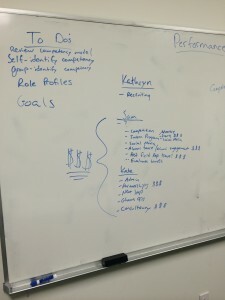 I created unique role profiles just like the US team and shared the same competency model so that they understood the expectations for their own growth. The second half of my trip was spent training them individually on the skills they would need to successful perform their new duties. To say they were quick learners would be an understatement and I’m still trying to figure out how they learned Microsoft Excel so fast. After two short weeks I headed back home, excited by how much had gotten done and nervous that it might not be enough. 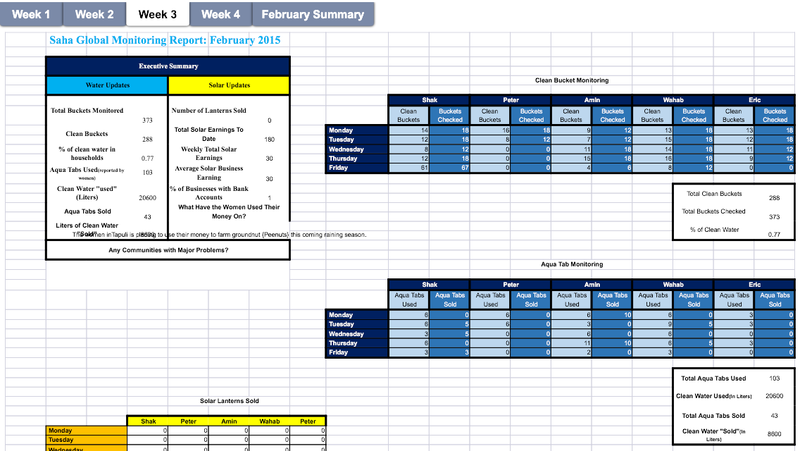 Saha Senior Manager, Wahab, has been killin’ it with his monitoring spreadsheets. He is now in charge of compiling everyone’s monitoring data and emailing them to Kate once a week. Click on the photo for a larger view! In the few weeks since I’ve been back I have seen a transformation in how Saha Global is operating – both in the US and in Ghana. The US team has moved into their new roles quickly with the launch of the new country competition, the creation of the alumni advisory board, and an enhanced focus on recruiting with an emphasis on data analytics. 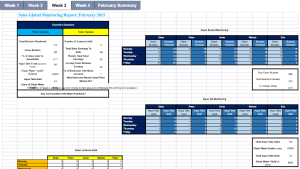 On the Ghana side I receive emails weekly from the team with updates, excel reports, and stories about how much they are enjoying their expanded roles. If you are an alumni, I definitely encourage you to reach out to your translator via email, they will respond! Seeing Saha Global continue to mature has been a truly humbling experience. Saha means opportunity, not just for the people of Ghana but for students and young professionals as well. I am so grateful for the opportunities Saha has given me, as a water field rep, a social enterprise winner and solar pilot, and as a strategic advisor. Even now, I am thrilled to announce that I have been giving yet another opportunity to continue serving the organization in helping it achieve its growth goals, this time as a member of the Saha Global Board of Directors. I look forward to serving in this new capacity and any other Saha sees fit. Stay tuned for more!